I like these, if only because of the fact they don’t bug me. I better explain that: the salt is where the salt should be and the pepper is where the pepper should be. In other words, somebody was paying attention. 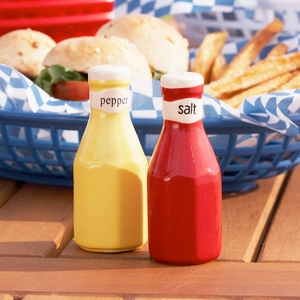 If forced to choose which spice would dress up as which condiment, I’d have to go with salt/ketchup and mustard/pepper, just like these salt and pepper shakers.